Mrs. Benchley: Well, why don't you say something? Robert Benchley: [as Donald Duck] Aw, phooey! Robert Benchley: [about Donald Duck; chuckling] He kills me. Only I can't understand a thing he says. Father: Oh, son, I seen it! Up on the bounds it was, all covered with scales and such, and a tail with a sort of hook on it! Now wait until I catch me breath. It's horrible! That's what it is, horrible! The Boy: It's only a dragon, father. Father: Oh... Only a dragon? Oh! The village! Help! There's a dragon a-coming! Help! The Boy: Don't worry, father. I'll have a look at him. Robert Benchley: Yeah, but he still doesn't move. Donald Duck: Just a minute, big boy. Give me time, give me time! Donald Duck: Look, I'll show ya. I'll show ya. Now look. First my foot is up here, see? Donald Duck: Then, it's down here, understand? Robert Benchley: Now I get it. Donald Duck: And that. See? Donald Duck: When I do it faster, I'm walking. Get it? The Boy: Do you mind if I recite a poem? The Dragon: You, boy? Why, well, oh, not at all! Sir Giles: Oh, of course, of course. Rather, rather! The Boy: 'Tis evening / From the stars above / A soft mysterious light / Brings thoughts of friendship, joy and love. The Boy: Now how 'bout that fight? Robert Benchley: It's a wild goose chase, that's what it is. I don't imagine he's out here in the first place. Mrs. Benchley: Where else would he be? The Dragon: Well, that's splendid! The Boy: Have you had any nice battles lately? The Dragon: Battles? Oh, no, no, no battles. No. The Boy: Oh. Oh, probably too busy scourging the countryside and devouring fair damsels, then. The Dragon: Scourging? Devouring? Good heavens, no. The Boy: But don't you ever do anything desperate? The Dragon: Well, yes, I... I do make up poetry. The Dragon: Verses, you know? Care to hear my latest sonnet? The Dragon: Oh, you'll love this. I call it, "Just A-Drifting". The Dragon: Just a-drifting o'er the leaves/Like a dewdrop, fancy free,/Playing with the gentle breezes,/Romping with the bumble beezes./Oh, what fun! Joy never ceases,/Just a-drifting. Narrator: [Goofy has fallen off his horse] When you've fallen from a horse, lie quietly. Remember, a horse will never step on a fallen rider. The Boy: Sir Giles, I presume? Sir Giles: Come, come, come, come, lad. Stop mumbling. The Boy: I came to talk about the dragon. Sir Giles: Ah, yes, yes, yes. Another tale of woe and misery, I suppose. Devoured your flocks, no doubt. Sir Giles: Aha! Made off with your loving parents, has he? Well, they shall be avenged! Sir Giles: What? Don't tell me he's kidnapped some fair damsel, with flaxen hair, and ruby lips, and form divine? Why, he can't do that to her! He shall pay dearly on the field of battle. The Boy: But that's just it. He won't fight. Sir Giles: Yes. He... He won't fight? Preposterous! The fellow must be an infernal cad. Bit of a rotter, what? The Boy: He is not. He's a nice old dragon who likes to write poetry. The Boy: Yes. You know, verses? Sir Giles: How jolly! Ha ha! I'm a bit of a bard myself, you know. The Boy: You a poet, too? Sir Giles: Yes. No doubt you've heard of my Ode to a Fleecy Cloud? Sir Giles: Oh fleecy cloud, O cloud of fleece, up in the sky so high... Oh. Oh, my. Sir Giles: Uh, the time has come, you know. The Dragon: [clapping excitedly] You mean... I die now? Sir Giles: Oh yes indeed. As per-agreed, we'll seal our pact, old thing. Robert Benchley: Very good. I like the way you handle that fowl language. Clarence Nash: [as Donald Duck] Foul language? Why the very idea! Mrs. Benchley: [Reading] "So they set off up the hill, arm in arm, the knight, the dragon, and the boy. The lights in the little village began to go out one by one." Mrs. Benchley: "But there were stars and a late moon as they climbed the downs together." Robert Benchley: Go on, I can hear in any position. Mrs. Benchley: [Continues reading] "And as they turned the last corner and disappeared from view, snatches of an old song were borne back on the night breeze. I can't be certain which of them was singing, but I think it was the dragon." Robert Benchley: Go on, I'm listening. Mrs. Benchley: That was the end, and a very lovely end, too. Robert Benchley: Yeah, charming, charming. It's funny. No matter which way I aim, I always hit the same duck. Mrs. Benchley: Robert, I have a wonderful idea. We'll sell this book to Walt Disney. Robert Benchley: Well, you can't. It belongs to your nephew. Robert Benchley: So does this, too. I wonder what he'd take for it. Mrs. Benchley: I mean the idea, for a movie. I'm sure if you went to his studio and suggested it to him, he'd jump at it. Robert Benchley: Me suggest a story to Walt Disney? Why, I hardly know him. Mrs. Benchley: Well, you hardly knew me when you suggested marriage. Robert Benchley: Yeah, look at the trouble I got into. He can't listen to every crackpot with a wild idea. Mrs. Benchley: You might be the exception. All you would have to do would be to go to his studio and show him the book. Robert Benchley: I wouldn't dream of it! Mrs. Benchley: They're always open to new ideas. Get your things on, and stop shilly-shallying. Robert Benchley: [Stands up on raft] I am not shillying and I am not shallying. But once and for all, I will not go to the studio. I will not make myself look ridiculous. Robert Benchley: [Bubbles come out of his mouth] And that's final. Doris: How did you like it? Robert Benchley: Oh, fine, fine. Only after all, wouldn't it be a lot easier just to wreck a real train? Nurse: You're a quiet little fellow, aren't you? Baby Weems: Well, there really isn't much to talk about. Baby Weems: Why? Is it against the rules? Doris: [Holding up a cel of Bambi in front of her] Like it? Robert Benchley: I'd be all right if you could get that reindeer out of the way. Doris: I'll see if I can scare up the background that goes with it. Robert Benchley: Nothing wrong with the one I just saw. Doris: [a man hands her a painting] Thanks. This is his background. He fits right on top of it, like this. There. Robert Benchley: And very cunning, too. I'd like to take him home with me. Robert Benchley: What do you know? He took me seriously. The Dragon: You've got to be mad to breathe fire, but I'm not mad at anybody. The Boy: But try real hard. Concentrate. The Dragon: Not very good, is it? The Boy: Nope. Too bad you're not a real dragon, instead of a punk poet. The Dragon: [Angry] "Punk poet"? The Dragon: Ooh, say that again. 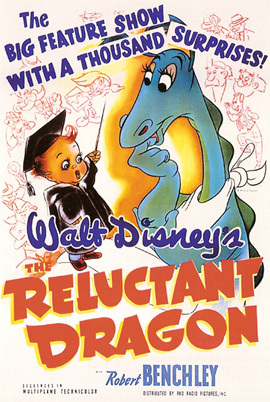 The Dragon: [Delighted] Ooh, I'm mad! I'm mad! I'm mad! The Boy: Punk poet! Punk poet! Punk poet!